A very comfortable and competent car but in V8 spec, it's in no man's land. “That’s the new VZ Holden, is it?” came the question from the other side of the car park. 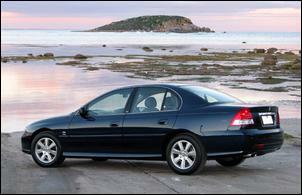 An average looking Joe materialises from behind his VX Commodore. “The Berlina, huh? Looks better than the previous Executive with that horrible bit of grey plastic hung off the back bumper. But, gee, it doesn’t look much different to the VY. “Oh, you’ve got the V8 model there. Yeah, I wanted one of those but the wife wouldn’t let me ‘cause it’d cost too much to run,” he says with the air of a person defeated. Little did we know it at the time, but this Average Joe typified many buyers’ perspectives and neatly summed up the VZ Berlina V8. 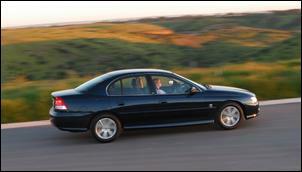 No, it’s not much different to the previous model but the Berlina model offers a lot more class than a base Executive. And the V8 engine? Well, yeah, everyone wants the grunt – but in the context of a mid-spec family sedan, who can afford the running costs? It’s especially difficult to justify now that the 175kW V6 is on the scene. 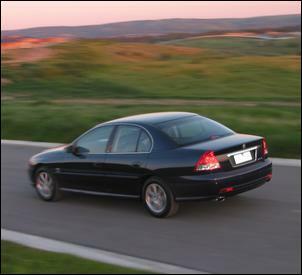 At AUD$45,830, the VZ Berlina V8 sedan falls into a marketing ‘no man’s land’. The extra costs associated with the V8 option are extremely difficult to justify for family car use and if you want it for performance, well, wouldn’t you be looking at a SV8 or SS? But it cannot be argued that this is a very competent all-round vehicle. In our week of driving we were constantly impressed by its practicality, ease of ‘ownership’ and on-road feel. Having just stepped out of the new Statesman V8, we recognised this trim level's inferior ride and NVH, but it's still very well sorted. 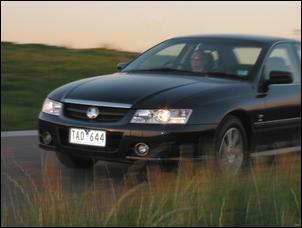 And so it should be, considering it’s been seven years since we saw the VT Commodore! Under the bonnet, the VZ’s 5.7 litre V8 brings electronic throttle control with suitably upgraded engine management, a revised exhaust and a larger diameter air intake system (including a bigger airflow meter). This new intake is said to reduce restriction by 25 percent. Curiously, the quoted power and torque outputs are unchanged compared to the VYII V8 – there’s 235kW and 460Nm. The VZ LS1 V8 is more throttle-responsive than we remember in previous models and, despite the claim that power remains unchanged, it feels quite lively through the top-end. It was no surprise to see our test car accelerate to 100 km/h easily in the low 7s. Note that the Berlina is offered only in automatic form. The old-tech 4 speed trannie is now quite refined during shifts, but its lack of sequential shift is a major downfall. Interestingly, switching the transmission into power mode makes a big difference to how the car behaves – it’s best to leave it in normal mode for the majority of driving. The biggest problem with the LS1 V8 is its running cost. During our test – which involved a considerable amount of highway cruising – the big Holden drank almost 17 litres per 100km. It becomes disheartening to fill ‘er up and see the fuel gauge sitting low after only a small amount of running around. Thankfully, the engine requires only 91 RON normal unleaded. With a thumping 5.7 litre V8 in a rear-wheel-drive Holden, it’s all too easy to jump to the conclusion that it must be an animal to drive. But this couldn’t be further from the truth. Nail the throttle to the floor and the LSD-equipped Berlina V8 does nothing except hurtle you down the blacktop. The traction control system for the VZ incorporates the new electronic throttle, which eliminates the cable-type system that used to kick back through the accelerator pedal. The new system makes the car much more pleasant to punt hard in tight conditions, where the traction control system is most active. The Berlina chassis is well balanced and, when properly set up into a corner, you can hear the front and rear 215/60 16 Bridgestone Turanzas yowling in perfect harmony – it’s not just the front or the rear tyres doing all the work. The suspension is relatively soft but never enough to upset the vehicle’s balance. If you’re prepared to wear a ride trade-off, you can opt for the FE2 sports suspension tune. The VZ’s suspension arrangement is a carry-over from the VYII, with the exception of revised front swaybar actuation. Note that only the new V6 models are equipped with stability control, the latest ABS and electronic brake assist. During our test the brakes gave perfectly adequate stopping power, but we did have some concerns about pedal feel – at times it was mushy and on more than one occasion while driving hard, we noticed a very rapid change in brake pedal weighting. It doesn’t have quite the linearity that it should. For the VZ, Holden has upgraded booster and master cylinder and the Berlina sedan comes with (non-electronic) brake assist, EBD and ABS. Likewise, the steering is fine overall but the rpm-dependant assistance gives dramatic weight changes – there’s considerable steering weight in parking manoeuvres but a lack of feel while cruising at high speed. Interestingly, the VZ scores a lightweight aluminium power steering pump and new hoses to reduce fluid temperature. There are no big changes inside. The cabin continues to offer plenty space for front and rear occupants and there’s enough rear seat width for it to be a genuine 5 seater. The boot is also amply large, though the 15 inch steel spare wheel is an obvious cost-cutting exercise. 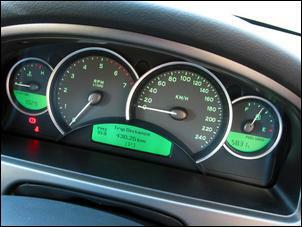 The VZ Berlina cabin is equipped with four airbags, a trip computer, automatic climate control (single zone), cruise control, an electric driver’s seat, auto headlights, rear parking sensors and a surprisingly good sounding 80W 6 stack CD sound system. 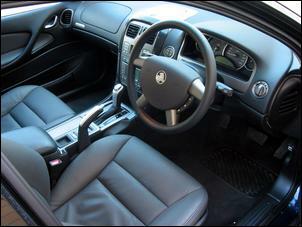 A leather steering wheel comes standard but the leather trim in our test car is a AUD$2050 option. The relatively hard leather that Holden uses should be durable. Oh, and the VZ upgrade brings new trim fabrics and, in the Berlina and <?xml:namespace prefix = st1 ns = "urn:schemas-microsoft-com:office:smarttags" />Calais, a lidded storage compartment at the top of the centre column. Visual separation from the VY Commodore is limited to a subtle nose and tail job, a sharper bonnet style and a new range of 16 inch alloy wheels. 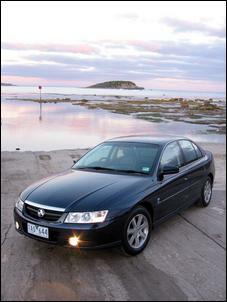 The Berlina also brings fog lights, full colour coding, chrome highlights and unique wheels (which are very plain looking). The VZ Berlina V8 is a difficult vehicle to summarise because it’s an obviously aging body with an even more obviously aging driveline. Its thirst for fuel is also a big turn-off for a vehicle that doesn’t fit into the performance or high-end prestige category. 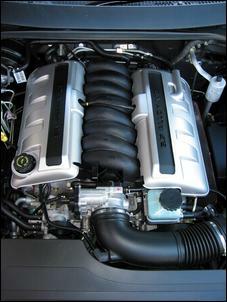 And be aware that the LS1 has a more frequent service schedule than the new V6. Still, it’s a vehicle that is remarkably competent.